PHILADELPHIA (WPVI) -- Tuesday's snowstorm is causing a number of businesses and attractions in the Philadelphia area to open late or close for the day. The Willow Grove Mall will be closed on Tuesday. King of Prussia will be opening at 12 noon today due to the inclement weather. We will provide additional updates as they become available. Due to inclement weather, Oxford Valley Mall will have a delayed opening today, March 14. The mall will open at 12pm. The Philadelphia Premium Outlets will be closed on Tuesday. The Plymouth Meeting Mall will be closed on Tuesday. The Philadelphia Zoo will be closed on Tuesday, March 14 due to the impending storm. The National Constitution Center will be closed on Tuesday. Independence National Historical Park is closed Tuesday due to weather conditions. Independence National Historical Park is closed Tuesday, March 14, due to weather conditions. 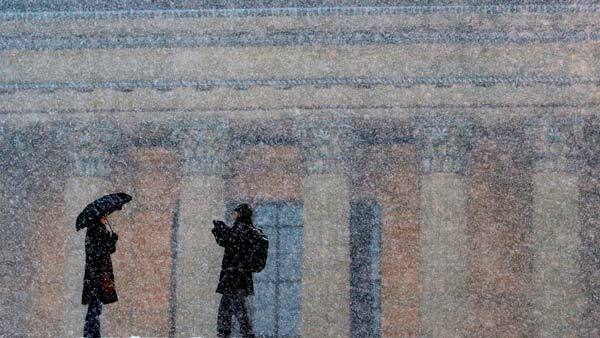 The Philadelphia Museum of Art will be closed on Tuesday. Longwood Gardens in Kennett Square, Pa. will be closed on Tuesday. The Franklin Institute has moved its Science After Hours from Tuesday, March 14 to March 21. Due to the weather, the Academy of Natural Sciences of Drexel University will be closed on Tuesday. The Independence Seaport Museum and historic ships will be closed on Tuesday, March 14, 2017. The Museum's Pi Day event has been moved to March 21. The National Museum of American Jewish History will be closed Tuesday. Pa Academy Fine Arts school and museum will be closed on Tuesday. Smith Playground will be closed on Tuesday. Woodmere Art Museum will be closed on Tuesday. Due to the winter storm forecast, the Battleship New Jersey will be closed for tours on Tuesday, March 14. Due to inclement weather, Adventure Aquarium will be closed for business on Tuesday.